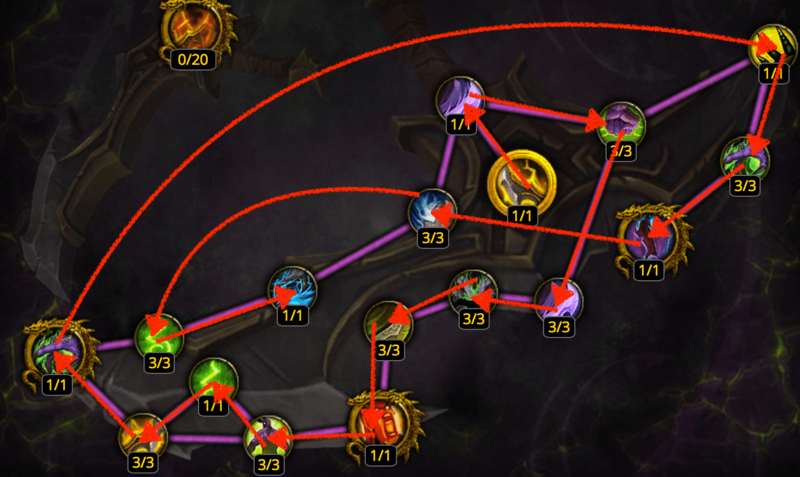 This is the path I plan on taking because it gives me the traits most useful for early game content and prioritizes the gold traits that effect the rotation the most. However, there are many optimal paths and you may prefer a different order, and we all end up in the same spot anyway. This trait unlocks automatically with the Aldrachi Warblades. It serves as a minor healing and damage cooldown. This trait dramatically changes your rotation. What might have been a simple threat generator before now gives you healing. See the page on Fire Damage interactions for more information. This trait is really fun, and it interacts with several other abilities. See the pages on Metamorphosis interactions and Soul Fragment interactions for more information. This trait adds a damage reduction component to Soul Fragments. See the page on Soul Fragment interactions for more information. Turns Fiery Brand into a damage and healing cooldown (when combined with Charred Warblades). When Fiery Brand is active, prioritize fire damage. Turns Empower Wards into a minor healing and damage cooldown, as long as it effectively reduces magic damage. It increases your agility based on how much magic damage you took while it was active, and agility in turn increases your self healing and damage (and gives you a tiny amount of dodge). Increases parry by a moderate amount for the first 3 seconds of Demon Spikes. See the page on Parry interactions for more information.